Apple may introduce its upcoming 6.1-inch LCD iPhone with a starting price of around $699 to $749, according to industry analysis by TrendForce. The pricing strategy is said to be partly a response to lower than expected iPhone sales last year, and partly a result of competition from Chinese brands that have expanded their market shares with devices that offer high performance at affordable prices. Three new iPhone models are expected to form Apple's 2018 lineup: two OLED models measuring in at 5.8 and 6.5 inches, and a 6.1-inch lower-cost LCD model. All three models will feature Face ID in lieu of a Home button, but TrendForce predicts the "budget" LCD device will be Apple's main device in terms of production share. The specs upgrades would make new iPhones more favorable in the competition with Android phones. On the other hand, the cost of this model has been approaching that of iPhone 8 Plus due to the upgrades. However, the 6.1-inch LCD model would be positioned by Apple's main product this year, with a production share of around 50% in the new iPhone series. Apple is bound to adjust the prices of this model to meet the market expectation and to further expand its market share. Considering the cost reduction of components, TrendForce estimates the starting price of this LCD version at around $699-749. 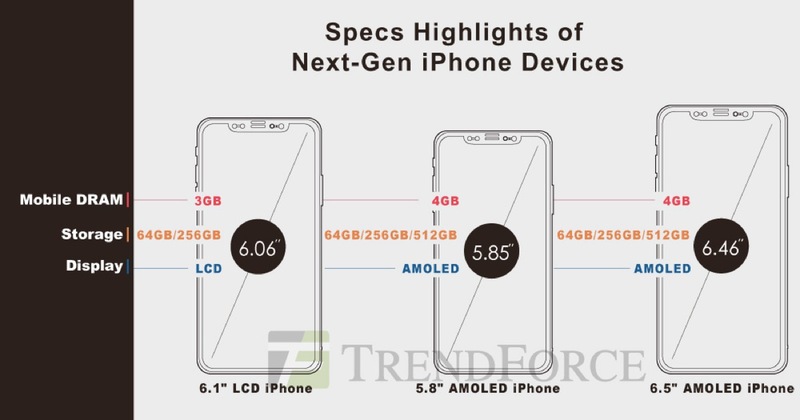 As for the new OLED models, TrendForce expects the 5.8-inch device will have a lower starting price of $899 to $949, while the current-generation iPhone X, which starts at $999, will enter its "end of life" process due to the similarity in the specs of the two models. Meanwhile, the upcoming 6.5-inch device will target the "premium business segment" with a starting price of $999. According to TrendForce, Apple has been bargaining with its supply chain partners to reduce the cost of components, especially those which have been used in earlier generations of iPhone. That view tallies with earlier reports claiming Apple wants Samsung to reduce the price of its OLED display panels so it can cut the cost of current and future iPhone X models. Price cuts to the display and other components would help Apple lower its bill of materials for the new models, with the savings potentially passed on to customers. For example, in line with TrendForce's prediction, RBC Capital Markets analyst Amit Daryanani believes the second-generation iPhone X will start at $899, down from $999. TrendForce expects the production volume of the three new iPhones to be around 83-88 million units, potentially taking a larger share of the company's annual sales volume compared with the three models it released last year. Sales volume of iPhones in 2018 meanwhile is expected to remain flat or grow marginally by 2 to 3 percent, owing to the saturated smartphone market and the longer replacement cycle of phones globally. TrendForce believes the two OLED models have been assembled by manufacturers since late July, while the assembly of the LCD models is scheduled for mid-September. Apple is expected to announce the trio of new iPhones sometime in September or October.